A variety of MIM components in complex shapes and forms, molded by Smith Metal Products, Center City, Minnesota. Photo courtesy of Smith Metal Products. As interest in metal injection molding continues to grow across multiple industries, including medical, misconceptions about the process persist. But where there's misunderstanding, there's also opportunity for part designers who stay abreast of the latest progress in the field. 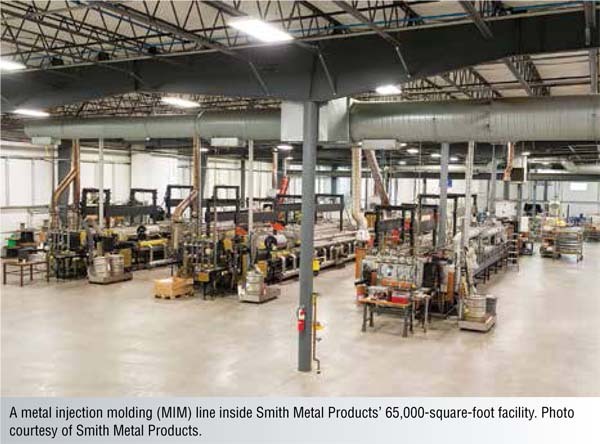 This article was contributed by Smith Metal Products, Center City, Minnesota (www.smithmetals.com). Medical device designers continue to hear about the benefits of metal injection molding (MIM) to produce components and assemblies for a wide range of medical devices. This once radical method for making metal parts has medical designers increasingly becoming advocates of the MIM process because of its quality, material savings, lower costs in medium to high volumes, and its design flexibility. Whereas early MIM criticisms centered on process control and repeatability for medical device applications, technology improvements have changed those attitudes for the better. Now, new MIM avenues for even the most difficult medical part designs are practical. Many are made from medically required materials, including titanium, as well as more commonly used various grades of stainless steel. Although MIM is not a replacement for every metal part application, it has shown strong growth across many industries, including medical. How strong? From just $9 million USD in 1986, to $382 million USD in 2004, to over $1.5 billion USD in 2015. Medical applications within those numbers have grown exponentially, according to industry reports. Medical MIM is metal injection molding, and, at times, is also called powder injection molding. It is differentiated from other types of MIM processes (automotive or aerospace applications, for example) because of specific medical requirements for minimal porosity and part cleanliness. Metal injection molding is a net–shape process for producing solid metal parts that combines the design freedom of plastic injection molding with material properties near those of wrought metals. Metal injection molding mixes metal powder with a thermoplastic binder and is molded into a cavity. The molded part is thermally processed (sintered), removing the binder while producing a net shaped, high density component. Because it is a molding process, it is capable of producing an almost limitless array of highly complex geometries in many different alloys. It is also a very good option for cost–effective medium–to–high volume part production. Compared to machined and cast parts, medical MIM costs far less per unit, offers greater design flexibility, is a much faster process in large quantities, and provides highly repeatable quality. Medical MIM provides benefits to a full range of medically–related applications, including retinal, cochlear, and dental implants, minimally invasive surgical devices, orthopedic implants, cardiac instruments, pacemakers, and many more. A common misconception of metal injection molding, particularly for medical device applications, is that the process yields 96 percent (or less) dense parts. In other words, subsurface porosity has potential for bacterial infestation, particularly if the parts require secondary operations, such as finishing. Although not all medical MIM parts require maximum density for bacteria resistance, hot isostatic pressing (HIP) of these medical parts is an often preferred and very effective post–processing solution. The HIP process is used to consolidate metals, ceramic, and composite steel, for example. Hot isostatic pressing can add durability for longer part working life with increased hardness, temperature resistance, and overall strength. Some part designers hold a misconception that MIM parts have cracks and other flaws in them. In the earliest development of MIM technology, part voids occasionally occurred as the powders coalesced into solid dense parts. The HIP process allows for high purity and fine grain powders to form into finished and semi–finished parts with minimal deterioration due to impurities, oxidation, or grain growth. Utilizing the HIP process for medical MIM parts has additional benefits as well. It may positively alter metal and alloy microstructure of certain preferred medical materials. This process has been refined and improved, and, as part validation procedures were implemented, these problems were eliminated. And because the process is highly repeatable, quality is maintained at high levels throughout production runs. Part size and dimensional tolerances are important to note. Sintered powder metallurgy technologies generally have a tolerance range from ±0.5% of the nominal dimension down to ±0.038mm or ±0.0015 on features of 7.5mm or 0.300 inch or less. It should be noted that every part project has its unique characteristics. Consulting with an experienced medical MIM supplier can provide part size parameters, along with tolerances and material recommendations. Over the last decade, many new alloy materials and improved formulations of existing alloys have been developed with successful medical MIM application. In fact, the material options are far broader than can be described in this article, other than to say that there is probably a material option for virtually every medical part requirement. Part designers who are educated in the benefits of most commonly used materials in their design work can start their MIM evaluation process from a number of material categories. The most frequently chosen MIM materials are ferrous alloys of stainless steel, iron–nickel magnetic alloy, and special ferrous alloys. Other commonly used materials are hard materials, such as cermets and cobalt chromium; heavy alloys and copper; and materials such as titanium, nickel, aluminum, and molybdenum, which comprise the widest grouping of special MIM materials. It should be noted that certain MIM suppliers specialize in particular groupings of these materials and may not have experience or capability in all potential MIM materials. Supplier variations on similar MIM parts due to feedstock, molding, cavity, furnace, part placement, and other differences can occur. The part designer should base material selection, as well as other relevant criteria, on the supplier's successful experience with that material. Another consideration for medical MIM is cost. Everyone is familiar with cost pressures that are affecting the health care industry, and medical device manufacturing in particular. Medical MIM brings opportunity for significant cost savings, both with materials and in the process itself. With medical MIM, parts are produced in net shape form, where material waste is virtually eliminated. Compared to machining, particularly where alloys and exotic materials are machined with significant scrap produced, medical MIM's net shape process produces no expensive scrap or lost material. 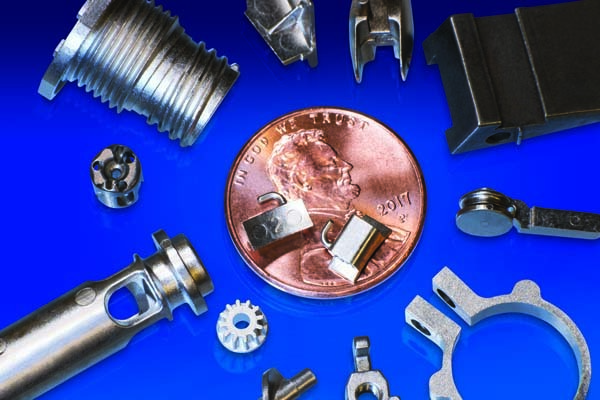 Additionally, because the process is fast, accurate, and highly repeatable, medical MIM provides savings in production time versus machining, particularly where larger part quantities of parts are required. Material and production cost savings will vary greatly, depending on the design variables of the part. Nevertheless, medical MIM's history for cost efficiencies continues to grow, particularly as more challenging and complex part projects are satisfied using the process. Meeting these challenges is a parade of newly developed feedstock materials, including new and improved alloys. 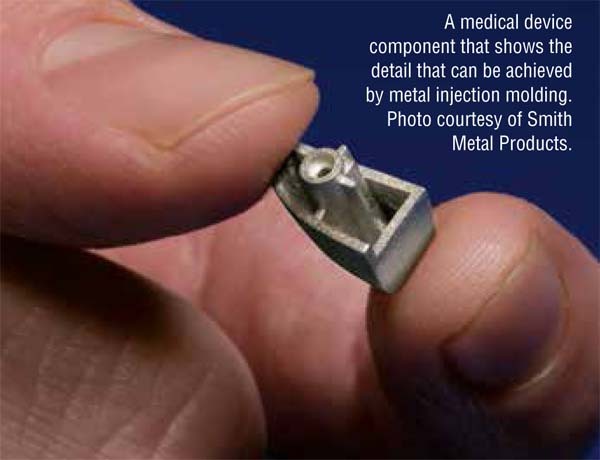 Medical MIM makes possible intricate, small, and lightweight components that are a challenge for precision machining processes. Medical MIM parts can be produced with thin walls, tight radii, and true position geometries. In fact, micro components that are of such complex shape that they are impossible to machine can be produced successfully using medical MIM. Examples are tiny check valves that regulate fluid flow into the body through small diameter tubing. Medical MIM implant applications not only are increasingly suitable, but are growing within the medical device industry. Medical MIM's use of biocompatible material alloys (titanium and cobalt) is gaining the attention of part designers. Much progress is being made in this area, and medical part designers are encouraged to stay abreast of these developments. Staying up–to–date with the progress of medical MIM is a worthwhile investment for today's medical device designer. Fortunately, access to the latest information has never been easier. Today, designers can find information on medical MIM on manufacturers' websites, as well as from sources such as the North American Metal Injection Association and the Metal Powder Industry Federation.